As we round out the second decade of the 21st century, employers are pretty confident that they are finally comfortable with The Millennial Employee. More or less. Like the Y2K fears that entered corporate corridors just before them, they seemed a uniquely turn-of-the-century phenomenon that we only knew we could not fully prepare for. It turned out that our systems were much more forward compatible than their humans – when’s the last time you heard about the Y2K bug? – who have struggled for over a decade to fully understand and integrate Millennial employees. To be fair, accommodating three such distinct generations brought unprecedented challenges. So, let’s try four. Because Gen Z has started entering the workforce — and is coming to an interview near you. 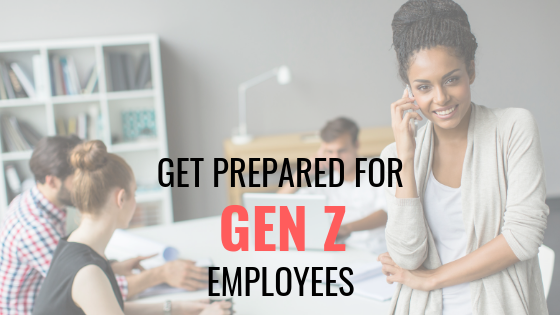 Are you prepared for Gen Z employees? Y they are different. First of all, come to terms with the fact that while they are both young, post-Internet era groups, Gen Z isn’t the same as Gen Y. Studies have shown that Y and Z are as different generationally . . . as they are alphabetically. So, a lot. If you assumed that Z is just Gen Y, intensified, step away from the foosball. What are some of the key examples of those differences? Gen Z are less collaborative and more independent than Millennials. Spend less time on social media. Strongly prefer face-to-face communication. And at the office, they’d rather have their own space – like, with walls and doors and everything – instead of open plan concepts. You don’t have to re-configure the floor plan yet, just note that the foosball table is (literally) showing its age. What is easier and more urgent is making small changes to the way your recruitment process works. Consider reaching out to Z candidates by phone – using the talk function, not the text one. Go on, it still works. X-actly what you need. While it might seem baffling that the first generation to be true digital natives prefer an IRL experience, you’ve at least seen the independent, entrepreneurial streak before. If you do the math, Generation Z roughly begins with those born in 1995. That’s when the first Gen Xers were entering their thirties – and parenthood. At the same time, Gen X has had the most generational conflict with their Millennial colleagues. And while there’s no evidence that Gen X literally are raising their children to have an active aversion to Gen Y values, there is evidence that the Gen X markers of skepticism, anxiety and hard-nose practicality are also characteristic of Gen Z. The upside is that Gen X managers may be more naturally prepared for Gen Z team members because they can… erm…relate to them. So will Boomers — some even argue that Gen Z is more like the Silent Generation. But Gen Y managers may be a bit blind-sided. Not only are they less experienced managers; they could find themselves outnumbered for the first time. This could result in decisions and processes that reflect the instincts and preferences of a coalition of their Gen X bosses and Gen Z team members. If the idea of a Gen X-Gen Z conspiracy theory appeals, keep it to yourself. You don’t have to feel sorry for your Millennials – but don’t forget they are highly likely to move on if they are unhappy at work, even if it’s a good-paying job. On the upside, 58% of Gen Z are willing to work nights and overtime to make more money. So, there’s that. Be sure to Zee what they want. Gen Y has been notable for putting a premium on corporate benefits that are ideological like CSR program participation, or experiential, like flexible work schedules. Employers will find that Gen Z are not the foosball-playing, group think type. They’re competitive, and they like to figure out things on their own. They are the most digitally fluent generation — but they leverage technology to learn stuff and do things, not to post or like them. Give them robust training opportunities that are online and self-directed, or even better, customisable (They’ve grown up in a customer centric world. It shows.). They are very DIY, entrepreneurial, and focused. (Again, your Gen X-ers will, like, totally get them.) And when it comes to employee benefits, Z workers care most about traditional, economic benefits – bonuses, comprehensive health care, 401K plans. In one study, 70% of Gen Z respondents said that health care was a job benefit must have (even before competitive pay or a boss they respect). Telecommuting has less appeal; they prefer structure, and seeing co-workers, in person, at the office. Even your senior management Baby Boomers can relate to that. Seriously, perhaps the best way to be prepared for Gen Z is to get a new plan for Gen Y.